Thusharagiri WaterFalls is located near to Kodencherry town near Thamarassery in Kozhikode District of Kerala State, India. Thusharagiri WaterFalls has an important place in Kerala tourism map. Thusharagiri means ‘snow capped or Misty Mountain’ in the local language; Malayalam. Thusharagiri Falls is the meeting point of two streams from Western ghats and they form Chalippuzha River from this point. The river diverges into 3 waterfalls resulting in a snow filled spray; thus getting its name Thusharagiri. Thusharagiri Waterfalls offers trekking and rock-climbing through the river path and waterfalls. There is a crocodile farm run by the Kerala state forest department near to the Thusharagiri Waterfalls. How do I Go to Thusharagiri WaterFalls? 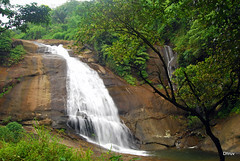 Thusharagiri WaterFalls is at a distance of around 11 kilometers from Kodencherry town. Thamarassery town (and the scenic Thamarassery churam on the Kozhikode – Mysore National Highway 212, via Wayanad) is at a distance of around 17 kilometers from Thusharagiri falls. Kozhikode (Calicut) town is at around 50 kilometers from the beautiful waterfalls of Thusharagiri.